The Series MX40 and MX4010 are used with the Exa E42, E52, and E62 series modulating gas valves. The MX4010 control system is for use with split manifold atmos­pheric indirect fired heaters. The split manifold operates as two independent manifold sections sharing a single inducer. The controller senses and maintains a constant discharge air temper­ature by modulating one section of the manifold and staging the non‐modulating section. Typical appli­ca­tions achieve a turndown of approx­i­mately 10:1 during continuous operation. For use with atmos­pheric indirect fired heaters using a 2‐stage inducer, the MX40 senses and maintains a constant discharge air temper­ature by modulating the gas flow and staging the inducer. Typical appli­ca­tions achieve a turndown of approx­i­mately 5:1 during continuous operation. 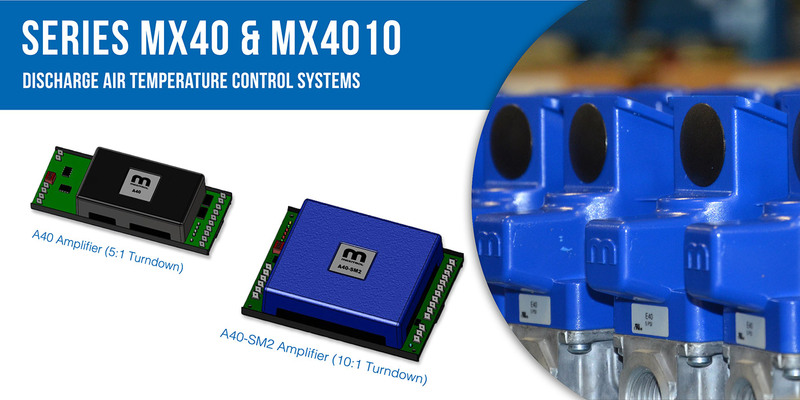 Series MX40 and MX4010 consist of either an A40 Amplifier (for 5:1 Turndown) or A40‐SM2 Amplifier (for 10:1 Turndown). Common compo­nents to both systems are a mixing tube and discharge air temper­ature sensor, and an optional remote temper­ature selector.